Wherever you visit those urban neighborhoods that were once this nation’s Polonia, you find numerous large and architecturally impressive Catholic churches, many of them in the northern Gothic style. They distinctively mark where Poles once lived in this nation's cities. Indeed, for the most part the churches remain standing five or six decades after the Poles were assimilated, prospered and then moved into the suburbs. Some of those that continue in operation now serve Hispanic rather than Polish Catholics. If you look a little further in Polonia neighborhoods, you will find Dom Polski halls, that is, "Polish home" buildings. In most communities, as soon as the Polish community was well established, churches were built and then a substantial hall for social events such as the one you see. These halls rivaled the churches as a focal point for the social activities of Polish immigrants and their children. These were also the places where Poles met when they undertook their efforts to elect officials who would respond to the concerns of their neighborhoods. The political machines in most cities recognized the value of the large Polish vote and, by the 1920s in metropolitan Detroit, first- and second-generation Poles were running for political offices. One of the first Polish Congressman from Michigan was Rudy Tenerowicz. He was born in Budapest to Polish parents who migrated to the Detroit area. Tenerowicz became a doctor, but took a strong interest in politics, was elected mayor of Hamtramck in 1928 and to Congress in 1939. Polish immigration to Detroit began in the 1880s. The first large settlement of Poles was on the East Side near the Eastern Market and a long Chene from about Jefferson through Hamtramck. 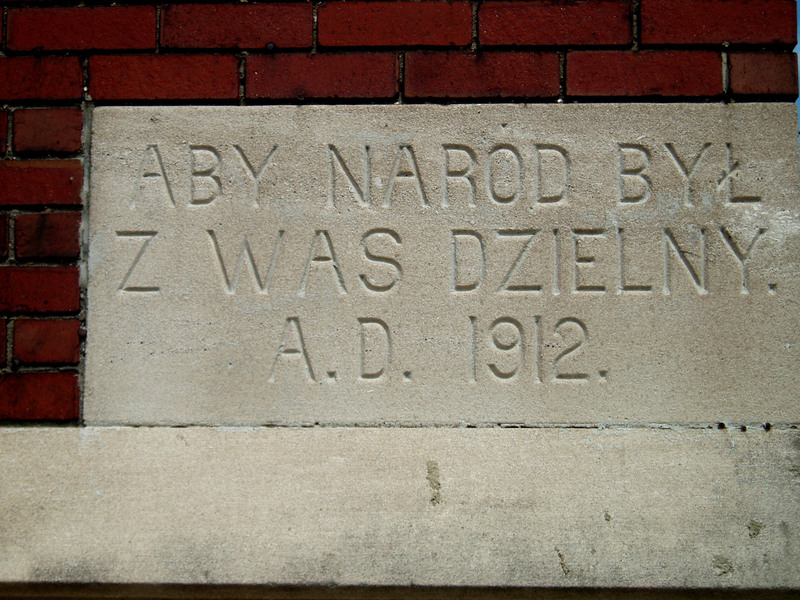 In the late Nineteenth Century Poles lived alongside Germans, but Poles became numerically dominant in several East Side neighborhoods during the first decade of the Twentieth Century. For the most part, they lived in modest workmen’s homes. These structures were not designed by architects, had little ascetic appeal, were on miniscule plots of land and were not especially durable since they were built at low cost. Poles moved away from neighborhoods such as the East Side of Detroit, especially just after World War II when the enforced saving households accrued during World War II, the availability of high-paying jobs and very favorable federal housing policies to made it possible for second-generation Poles to buy attractive, if small, new homes in the outlying parts of the city of Detroit and, then later, in the suburban ring. Presumably as Poles moved to the suburban ring, the use of Dom Polski Hall declined but I do not know when this attractive building was last used or if there are plans for its renovation. There is a corresponding West Side Dom Polski Hall standing at 3426 Junction. That building was designed by Joseph J. Gwizdowski and opened in 1915, two years after the one you see opened. 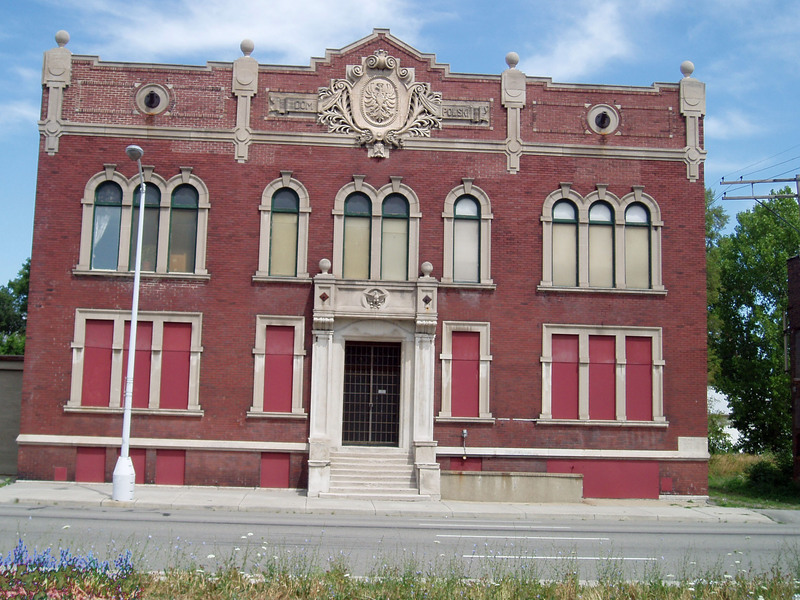 The Dom Polski Hall at 1519 Oak Street in Wyandotte is still open and is used as a banquet and meeting facility. Use in 2007: An unused building awaiting renovation or demolishment.